–Their vitals: Reigning second star of the week Adin Hill, who is 3-0-0 and has stopped 60 of 61 shots through four games (two starts), is expected to start in goal and will be backed up by Calvin Pickard. Darcy Kuemper (IR) and Antti Raanta are both day-to-day with lower-body injuries, though Raanta traveled with the team. Arizona is also without Christian Dvorak (IR/upper-body) and Jason Demers (IR/lower-body), as well as forward Michael Grabner, who took a nasty Sammy Blais stick to his right eye Saturday. The Coyotes lead the league with 10 shorthanded goals. Four have been scored by thre injured Grabner, three by ex-King Brad Richardson. “They look to jump, and lots of times that’s a great way to kill a power play,” Desjardins said. “All of a sudden if you’re willing to jump, then the power play has to back off a little bit, so we do have to respect that.” The Coyotes have played in 15 games decided by three or more goals – the second-highest in the league – and have won eight of them. It was announced today in the expansion releases that when Seattle enters the league and joins the Pacific Division in 2021-22, Arizona will hop over to the Central. When that happens, it will mark the first time since 1981-82 that the Kings and Jets/Coyotes have been in separate divisions. –Earlier today we learned from Desjardins that Trevor Lewis had suffered a “setback” in his efforts to return from a fractured foot suffered at the morning skate in Chicago on November 16. Rather than anything involved with his training, it was more just the recalibration of the type of his injury “where we thought it was maybe going to be something a little quicker, and now they have to reevaluate,” Desjardins said. The update is in: Lewis had surgery this morning to stabilize the fracture in his foot, per LA Kings PR, and will be expected to miss four-to-five weeks from today. He has two goals and three points in 17 games. –Meanwhile, Jack Campbell is coming along. “I don’t know when he’s going to skate, but his progress has been good,” Desjardins said. In Calgary last week, LAKI shared that his injury, which necessitated the same surgery as Quick, was expected to sideline Campbell for “a touch longer” than Quick. He injured his meniscus on November 10, so this Saturday will represent the four-week anniversary of an injury that was expected to sideline him for four-to-six weeks. Quick returned after just over five weeks, for what it’s worth. 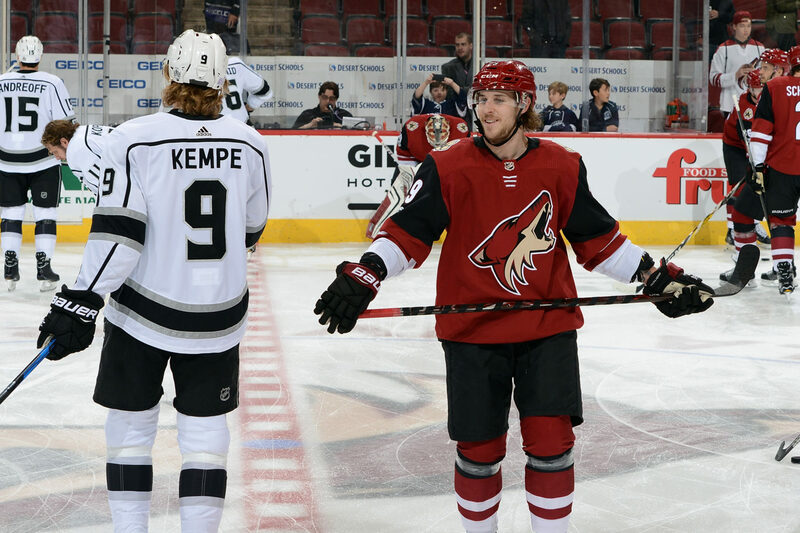 Mario Kempe, a forward for Arizona, was on hand to witness it. Though they’ve played against each other in the preseason, tonight’s game will mark the first time they’ve ever faced off against each other in a regular-season NHL game. The brothers’ mother is in town for what will probably get some spin around the Västernorrland County hamlet of Kramfors. Though Mario also took warm-ups prior to a 3-2 Arizona overtime win at Gila River Arena last November, they haven’t faced each other on the ice since the September, 2017 exhibition season. –More to come from Leipsic and Scherbak, as well as the NHL news from the Board of Governors meetings. Tonight’s officials are referees Gord Dwyer and Garrett Rank and linesmen Matt MacPherson and Steve Miller. Carlos Loera will perform the national anthem. Let’s talk soon, Insiders.